I received an e-mail from a company I was not familiar with, SAMtrees. Anyone ever heard of them before or have their trees in your wargaming or diorama layouts? Can anyone vouch for their quality? The Chinese-based company touts that it manufactures “high quality model trees, model scenery supplies at extremely competitive prices.” They have been supplying the architectural model market for more than twenty years with trees and supplies. SAMtrees offers a broad range of model supplies and is willing to discuss specific designs and requests from customers for custom-manufactured product lines, assuming sufficient market demand. Etched Model Trees : Specifically designed for high quality architectural models. Available from 10mm to 150mm in height. Wire Model Trees : Premium trees, wire branches and trunks. Palm Trees : Etched, Mexican, Coconut, Royal Palm and Canary Island Date Palm, with more under development. Plastic Trees : model trees ideally suited to railway & wargame modelers (no retail sales, wholesale only). Grass Mat : Up to 1.2M x 2.5M size (available in a range of colors). What was your all-time favorite wargaming session, and why? Many of you have played dozens, perhaps hundreds of wargames. Is there one or two games that really stand out in your memory, and why? For newer gamemasters that may be reading this blog, let’s give them some advice as how to create memories for those playing in their games. What advice or tips would you give to new GMs based upon the most memorable games you have ever played in – that “wow” factor that differentiated those particular games from the routine or ordinary? What would you like to see in the pages of hard copy Charge? As Debi and I start planning for 2008 and our fifth year of editing and publishing Charge!, the official hard copy newsletter of the Johnny Reb Gaming Society, we are soliciting input from you, the Civil War wargaming community, for your indeas and input as to what topics, articles, or information you would like to see in upcoming issues. Got a favorite subject that needs some in-depth treatment? What about a specific regiment or brigade that you would like to see covered? Any battles that need scenarios? Painting guides that are needed? We REALLY solicit your feedback as we strive to keep Charge! as the premier active newsletter for ACW gamers. Quality and variety are what we are seeking and, as a Six Sigma champion, I strive for continuous improvement not only at work, but in my hobbies and writing. In addition, we covet your written articles – after-action reports, original wargaming scenarios, painting guides, terrain tips, historical articles on specific Civil War topics, and campaign ideas. Send an email to the Johnny Reb Gaming Society and let us know your thoughts, ideas, and proposed submissions! All messages will be read and acknowledged by the editors. New entry level miniature wargame! Flaming Monkey Games is a relatively new company that specializes in easy-to-learn, fast-paced that young generals can readily master to help ease them into the hobby of miniature wargaming. The company recently announced the launch of an addition to their new Battlebox series – this one abstracting the Civil War. The second in what is planned to be a continuing series of entry-level strategic wargames, this combines a dice-based boardgame with plastic ACW miniatures. The thick cardstock board has a litho-printed map of the divided United States of early 1861. Players manueuver 20 playing pieces (10 Yankee, 10 Rebel) from square to square, hoping to outmaneuver (and out roll) the opponent to seize territory. Rules are easy to learn (only a single sheet of paper!) and the action is fast paced and quick to grasp. The boxed game sells for $10 and includes the mapboard, 20 HO scale plastic blue and gray figures, dice, and the rulesheet. Anyone that purchases a copy of the new Civil War game will be rewarded by having a second copy sent for free to their local school’s game club if desired. 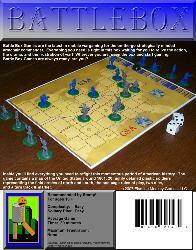 The next two releases in the Battlebox series will be comparable World War II games. Flying Monkey is also playtesting and readying a new easy-to-play miniatures ruleset, My Brother’s Keeper, for a December 2007 release. See their website for details. Francis B. Wallace was a newspaperman from rural Schuylkill County, Pennsylvania, a mountainous coal mining region northeast of Harrisburg. His paper was appropriately entitled the Miner’s Journal, and it provided regional coverage from its offices in Pottsville. When Confederates threatened Pennsylvania and Governor Andrew Curtin called for troops, Wallace and several of his employees at the paper enlisted in what became the 27th Pennsylvania Militia. He provided periodic reports for his readership. Here’s an excerpt from one of his early letters to the newspaper, covering his first days as a rookie soldier at Camp Curtin in Harrisburg. “There are arrivals of troops daily, both from New York and Pennsylvania; and it is enough to make a Pennsylvanian blush for his State, to see the manner in which New York sends her men into the field. They are splendidly organized and are as fine a looking body of men as can be found. Our militia came here in “rags and tags,” and, until they don Uncle Sam’s uniforms, look but little like soldiers come to defend their own State. We have all kinds of Camp rumors, but they cannot be traced to any reliable source; but I am told that Camp rumors are the most uncertain things in a soldier’s life. We have had several Rebel prisoners, and one suspected of being a spy, in the guard house here. They are the most forlorn and God-forsaken looking creatures I ever saw – ragged, dirty and lousy; they have little or nothing to say; but nevertheless, seem to be perfectly contented with their situation. On Sunday morning last, Rev. Mr. Austin, Chaplain, preached to the soldiers. I did not go to hear him, as the weather was rather damp, but I have heard his sermons spoken of in the highest terms. In the afternoon, our Company was called out to receive their arms. We have the Springfield Rifle musket, an excellent arm, carrying a ball a distance of 800 yards. Thus far, I have looked in vain for a copperhead among the soldiers here. There is not much danger of their arming here until the Rebels get possession of the Capital, when I suppose they will rush en masse to receive their dear southern brethren, who have been so badly treated by the Northern abolitionists. Camp life is not altogether devoid of amusements. There is one kind which was quite common in Camp Curtin – a man would get into a blanket, held by fifteen or twenty men, and they would throw him up into the air fifteen or twenty feet. The man while in the air would turn about in all manner of shapes, reminding a person of an acrobat in some circus. He is caught in the blanket again as he comes down. Little did Lieutenant Wallace realize that he and his men would slog into Maryland in a fruitless pursuit of Bobby Lee following the Battle of Gettysburg, and these untrained soldiers would suffer from illness, exposure, and the hardships of being sent off to war with just three days of training. Luckily, they saw little combat, other than a skirmish at Wrightsville, PA. In a part issue of the hard copy Charge! wargaming magazine, I reviewed the painting service of Sanath Fernando, a businessman in Sri Lanka who contracts custom painting of wargaming figures, including Civil War figures. Sanath e-mailed me to announce his new prices for 15mm and 20mm Civil War figures. His last price increase???? 15 years ago! Not many other wargaming dealers can make that same claim. 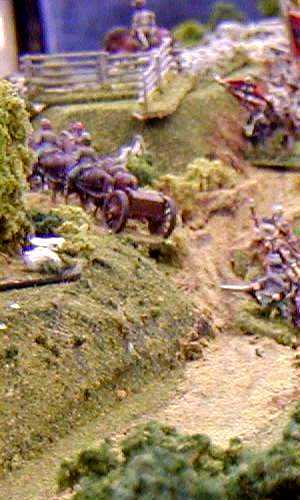 Editorial comment: While Fernando’s prices are quite low, I much prefer to purchase my painted 15mm ACW figures from Larry Reber at www.gettysburgsoldiers.com. Larry is meticulous, accurate, and consistent in his quality and service. My son Tom and I drove down to Antietam today to partake in some of the commemoration events for the 145th anniversary of the Battle of Antietam (Sharpsburg for you folks from south of the Mason-Dixon Line). I started the day by signing several dozen copies of my book, Human Interest Stories from Antietam, which sells well at the Visitors Center. Then, Tom and I took in a very good and well presented overview of Civil War artillery and its role at Antietam by park ranger Jim Bailey. His talk included my favorite topic, human interest stories and anecdotes. Bailey spoke about the Richardson brothers of Parker’s Battery (a part of S.D. Lee’s battalion firing from the plateau near today’s visitors center). One brother, David, had been wounded at Second Bull Run; a second, 15-year-old Ken, still served with the battery as it moved into Maryland. Before the brothers enlisted in the battery, their mother had insisted that if one son was injured or killed, Captain Parker would immediately send the other one home. Parker did not comply with (or even recall agreeing to) this early war request. When he received a letter from the mother reminding about his commitment, he wrote back that he “was not in the business of unenlisting soldiers.” Ken was not allowed to go home and was mortally wounded at Antietam. Years later, when the famous photograph of the dead around Dunker Church was published in several books, David Richardson, by then long recovered from his Manassas wound, recognized the corpse of his younger brother. 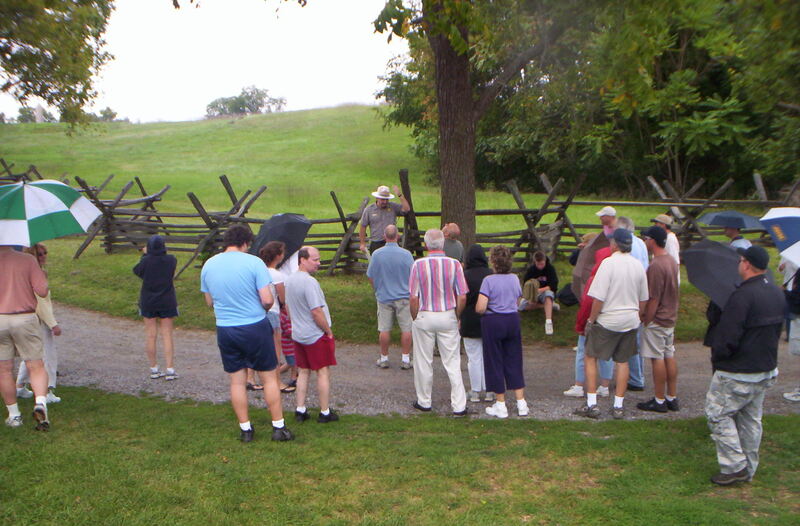 Following a hearty Italian lunch up in Hagerstown, Tom and I drove back to Antietam and spent the afternoon in a throng of park visitors who were led on an excellent 3-hour tour of the battlefield by Ranger John Hoptak. Intermittent rain did not spoil the event, which may have had 100 or so attendees. We then returned to the visitors center to do some browsing before heading leisurely back north to our home in York, PA.
Several battlewalks are on the calendar for the next three days, including an all-day hike on Monday. Ed Bearss is the special speaker on Saturday night. The next hard copy issue of Charge! magazine will contain Sgt. Chris Maes’ long anticipated add-on rules for Johnny Reb 3 covering combined arms, with a focus on riverine and coastal naval operations. These suggested rules, known by the colloquial nickname for sailors, Jack Tar, allow the traditional Johnny Reb 3 gamer to add in warships, ironclads, cottonclads, transports, and other watercraft to land-based JR3 games. Rules, charts, and suggestions are included, as well as a sample scenario covering the attack on Fort Fisher in North Carolina. Watch for Issue #17 in November 2007. Hard copies will be mailed to all current members of the Johnny Reb Gaming Society by the middle of the month. Elctronic copies will be posted on-line at www.magweb.com in early 2008. Why not try out these new rules over the winter and pick up a few ship models from your favorite wargaming dealer? Two of my favorite passions meet! The old television jingle says “I love Baseball, hot dogs, apple pie, and Chevrolet!” Well, I do indeed love to grill hot dogs over an open flame. I enjoy hot apple pie fresh from the oven with a scoop of vanilla ice cream (my grandmother made the BEST apple pies I ever ate! ), and I drive a Chevy. However, even more than these, I love baseball! For many years, I was a collector of sports cards, with an emphasis on my favorite team, the Cincinnati Reds and, in particular, the “Big Red Machine” of the 1970s. Johnny Bench was my favorite professional ball player of all time. Another passion of course is miniature wargaming and collecting model and toy soldiers. Larry Reber of www.gettysburgsoldiers.com is one of my favorite people in the wargaming hobby. 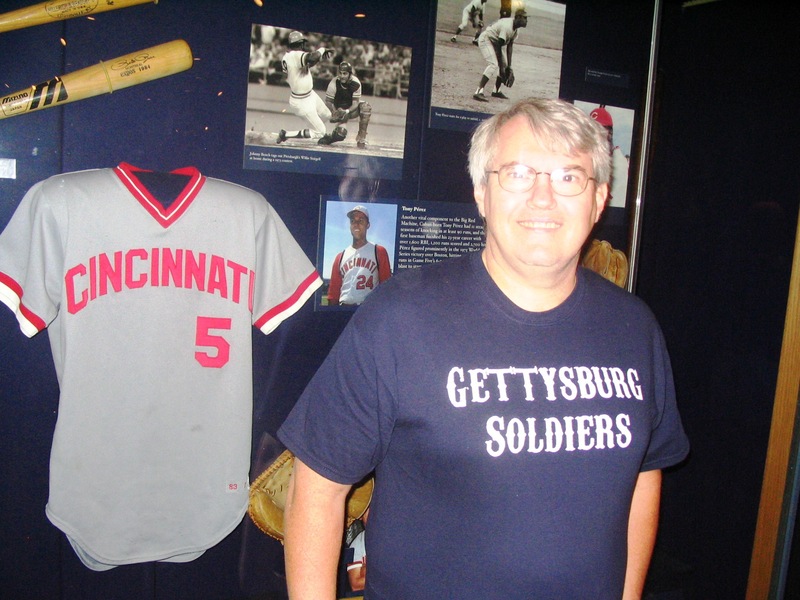 The above photograph was taken by my son Tom Mingus during our August 2007 visit to the Baseball Hall of Fame in Cooperstown, NY, showing me standing in front of Johnny Bench’s jersey. My shirt is one advertising Larry’s business, combining my love for wargaming with my passion for the Reds. Only one member of Baseball’s Hall of Fame is known to have served in the army during the American Civil War – Morgan G. Bulkeley, a wealthy insurance man and the first president of the National League in 1876. At the outbreak of the war, he left his father’s insurance company and enlisted in the 13th New York Infantry and fought in the Army of the Potomac under George McClellan during the Peninsula Campaign. He also served in the Maryland Campaign. Following the war, his insurance business (Aetna) prospered and he became influential in Connecticut politics, serving as governor and later as a one-term U.S. Senator. Although only in charge of the National League for one year and with no connections to the sport before or after his tenure, he was elected in 1939 to the Baseball Hall of Fame. Ivor Janci of Marek/Janci Design of Wheaton, Illinois, designed and published my first three wargaming scenario books, namely the Enduring Valor series and Undying Courage, which covered Gettysburg and Antietam respectively for regimental-level Civil War rules. Ivor and I are again collaborating on another Gettysburg Campaign scenario book, but this time it is for skirmish level gaming such as the popular Brother Against Brother rules set. The maps have been drawn (they are brilliantly colored, with excellent graphics and custom-drawn troop icons) and work is beginning on layout concepts. The book should be in production in 2008, hopefully in time for the annual HMGS-East Cold Wars convention. An exact date has not been set. One thing that has been determined – we are changing the working title of the scenario book. Since inception, we had planned to call it My Brother’s Keeper, a deference to the Brother Against Brother title and the famous Biblical quote. However, Ivor has learned that a new corps level rules set is planning to also use this same title, so to avoid any confusion in the marketplace, we have deferred to a new working title, Brothers Divided. Unless someone else comes along with plans to use that title, we will run with it.